Last night, hundreds of settlers accompanied by Israeli forces invaded Balata refugee camp in Nablus to pray at Joseph’s Tomb. Israeli soldiers shot tear gas canisters and sound bombs at residents who protested the incursion – three youths were reportedly arrested. At around 12am, several buses carrying hundreds of settlers, escorted by Israeli military, invaded Balata refugee camp. The settlers went to Joseph’s tomb to pray while Israeli soldiers separated into various groups and patrolled the area around the tomb. Residents of Balata, outraged by the incursion, left their homes to protest the invasion and were soon met with tear gas canisters and sound bombs shot at them. Soldiers blocked all entrances of the refugee camp, severely restricting movement of people in and out of the camp. International activists were present at the scene and could witness how Israeli soldiers were shooting the teargas canisters directly at people rather than in an arc as the Israeli military guidelines on shooting teargas dictate. Soldiers also fired teargas directly into the narrow residential streets, several times hitting and damaging civilian cars. No one was injured there are reports that three Palestinian youths from the area were arrested. Running from the tear gas canisters fired at protesters, one resident stated: “This happens every week. This is our life in the camp; constant settler and army invasions…the Israeli army comes with the settlers to protect them while they are praying but we, Palestinians, have no right to be in our camp”. Indeed, this type of incursion is part of the daily life of Palestinian refugees living in Balata camp. Israeli settlers believe that Joseph’s tomb is a holy place, where Joseph is buried. 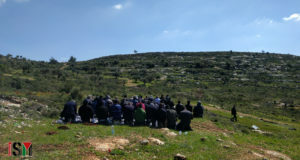 Thus, groups of extremist settlers storm the camp and perform religious rituals on a weekly basis. Israeli soldiers, as usual protecting the settlers, shoot tear gas canisters and sound bombs at residents around the tomb.